The Booking Confirmation email is the one that guests see right away after booking. Its' the one that says "You've successfully booked...!" at the top. It's now fully editable just like your other email templates. 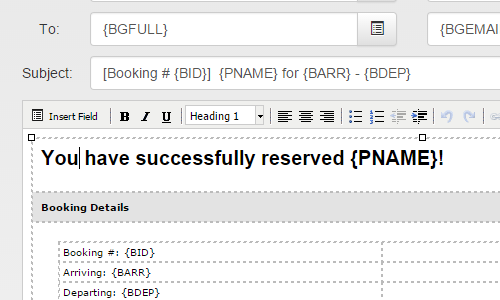 If you had 'custom paragraphs' for the booking confirmation email before, that information has been preserved as a new field definition on your properties. These new fields codes are available anywhere you are editing a template or legal agreement. In the near future, you will be able to use these within Form Themes as well.